It has long been said by racing veterans that to really appreciate a first victory, you have to lose a race first. We're not just talking about the mentality that “second place is the first loser” either. We're talking about a heart-wrenching defeat where everything seemed to line up for a victory on a given day, but fate took that chance away. Too often though, that wisdom is lost on the newest generation of drivers. There are too many kids out there with excesses of talent and money who just haven't learned true disappointment. How would they? If you hop into the best equipment that money can buy and you become an instant success, how would you relate to the struggles of becoming a winner the hard way? 16-year-old Derek Ramstrom isn't one of those kids. His father runs an auto repair shop, not some mega-corporation, so winning equipment has to be earned by hard work rather than simply writing a check. Ramstrom knows a thing or two about disappointment too. Earlier this month, he started in the rear of the field when PASS North went to his home track of Thompson International Speedway (CT). Ramstrom had the fastest car and put on the best driving performance by moving through the pack and making it up to the lead. But he also got squeezed into the wall on a late race restart and had to wait another day for his first PASS North victory. 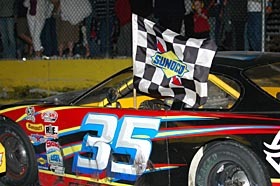 That other day turned out to be a 200-lapper on Wednesday evening at All-Star Speedway (NH), where Ramstrom ironically benefitted from two-time PASS North champion Johnny Clark's heartbreak to post his first touring Super Late Model victory. Ramstrom took the lead on lap 174 after the Clark, who appeared unstoppable, had a flat tire. Clark's car slowed in turn two with a flat tire and as he limped down the backstretch. Cars scattered to avoid Clark, as the green flag was still out. But not everyone could clear him and Clark was run right into the back of by Rich Eaton's #4E. Eaton, an All-Star Speedway regular who had run as high as third in the race, dropped out instantly. Amazingly, Clark was able to change tires, fix a little bit of damage to the car and solder on - just not in the lead anymore. “You never like to see another competitor just go down like that,” said Ramstrom. was up in the top five…then the top three…then the lead. When Ramstrom got close to the lead, he found plenty of closely matched cars. Yes, Johnny Clark was running away with the show but when it came to the battle for the second-best racecar at All-Star, there were no clear winners. Richie Dearborn, Kelly Moore and Steve Berry all led laps early. Richard Moody Racing teammates Ben Rowe and Trevor Sanborn were plenty quick. DJ Shaw made the right moved to work through the pack. 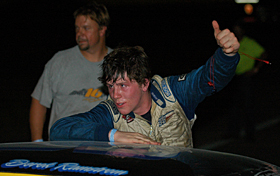 Adam Bates, Mike Rowe, Travis Benjamin and Scott Chubbuck were all strong at various points in the race as well. But Ramstrom didn't show his strength until late in the event. 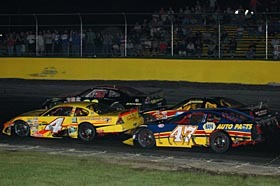 In those final 26 laps, Ramstrom had to hold off a charging Mike Rowe and Ben Rowe to keep the lead. He also might not have known it at the time, but Clark was flying back through the field as well. 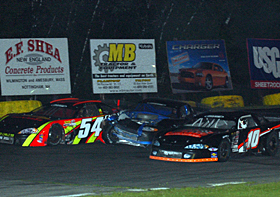 Ben Rowe (#4), Kelly Moore (#47), and Derek Ramstrom (#35) work lapped traffic while battling within the top five. “To hold off Mike Rowe and Ben Rowe, that was great,” said Ramstrom. Holding off the Rowes wasn't just something that had to be done under green. Ramstrom had to keep the lead over a pair of late race restarts as well. Meanwhile, Clark's march back through the field ended in fourth place - which was where he ended up at the finish. Still, all things considered, that wasn't a bad result. Travis Benjamin finished fifth to stay within a stone's throw of the PASS North point lead, which unofficially went back to Ben Rowe after the All-Star event. Ramstrom's victory marked the third time this season when a popular young driver broke through to victory lane in PASS North. DJ Shaw also won at Wiscasset and Adam Bates took the victory at Beech Ridge earlier this summer. be a shoo-in to pass with flying colors. Derek Ramstrom in victory lane. Rich Eaton runs into the back of Johnny Clark's crippled #54.